Add this film to William H. Macy's ever-lengthening resumé of sad sack roles. In The Cooler he plays Bernie, a character so down on his luck that it's actually contagious. Working in a Las Vegas casino, his services are called upon whenever a gambler hits a hot streak. Bernie pays the player a tableside visit and buys him a drink, or pats him on the shoulder, and the dice go cold, the cards turn mean and the house saves a pile of dough. 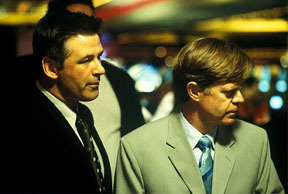 The plot gets going when Bernie informs casino owner Shelly Kaplow (Alec Baldwin) that, in one week's time, he's leaving town. Shelly doesn't want to lose his ace in the hole and employs new waitress Natalie (Maria Bello) to seduce Bernie and keep him in Vegas. Sure enough, Bernie falls for her and then she falls for him. And nobody in love can be unlucky. Now Bernie has somebody who wants to leave town with him and he's no longer souring the worlds milk. From here the story takes a couple of turns; fortune, which is what this movie is supposed to be about, slides from one character to the next, leading to a completely untenable conclusion in the desert. Macy's very sympathetic, Bello conveys some mileage and Baldwin hefts good weight as the malevolent old school casino mobster. The plot's a little self-conscious and flabby but the characters are compelling enough to keep it from being painful. The idea of a realistic, magic film noir is appealing but, as The Cooler proves, it's not easy to pull off.